Monsoon is here and so is the rainy day season. Don’t worry, we are talking about the happy ones. Well then let’s learn about that and some more ‘rainy day idioms and phrases‘ to make your vocabulary as colourful as the monsoon. • We knew a rainy day would come sooner or later. • My mother always taught me to save for the rainy day. • You just need a good night’s sleep, and then you’ll be as right as rain. • Whatever that astrologer said about my future, proved to be as right as rain. • The match got rained out/off in the second innings. • Don’t go at this time, it’s raining cats and dogs outside. • I’m sorry to rain on your parade but you’re not allowed to drink alcohol on the college premises. • Come in out of the rain and see how they are using you for your own benefit. • I’m sorry but I have to take a rain check for tonight’s dinner. How about next Sunday? • मुझे क्षमा करना मगर मैं आज रात खाने पर नही आ सकुंगी। अगले रविवार के बारे में क्या ख्याल है? 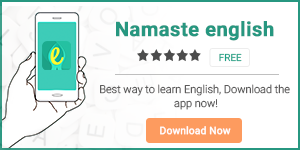 Don’t forget to download our app Namaste English.